Another reason to book with confidence is Your Golf Travel's Best Price Guarantee. We believe that booking the golf trip you want should be at the best price available, not to mention offering the most personable and knowledgeable customer service. That's why we have created our "Best Price Guarantee" so you can always book your golf travel with full confidence. What offers does the Best Price Guarantee apply to? 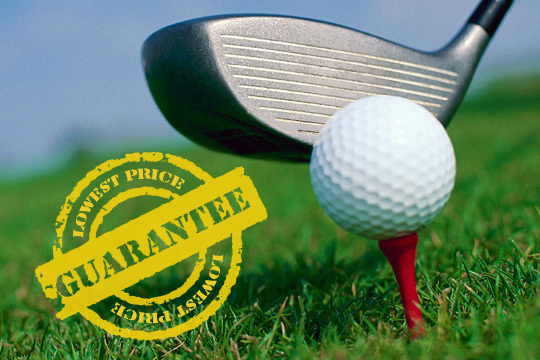 Simply put, the Best Price Guarantee covers every part of your golfing trip, from air and ground transportation, accommodation, golf and additional activities. You will not find a more comprehensive price assurance available on any golf travel website on the Internet. Call your designated sales person within 24 hours of booking and tell them you have found a lower price. If you can provide acceptable written documentation, we will gladly match the price. See Terms and Conditions for any restrictions that may apply. All elements of the package must be identical to qualify for the Best Price Guarantee including, but not limited to: duration of stay, rounds of golf, ground transportation vehicle type, air transit arrangements, air travel cabin class, accommodation provider, room or suite type, board basis, golf courses and tee time slots. Should a lower price be proven from another golf travel company meeting these criteria, Your Golf Travel will match the price.